The Research Career Development Institute (CDI) for Psychiatry is a multi-faceted longitudinal training experience for young psychiatrists and PhD researchers interested in successful research careers in academic psychiatry. The CDI for Psychiatry includes a comprehensive program of career and skills self-assessment, individualized career goal setting, a four-day workshop, structured long-distance career mentoring and goal tracking, webinars (online meetings) and tutorials, and a multi-tiered program evaluation. The program is geared toward individuals at the critical transition point between the completion of research training and initial faculty appointment or very early in the initial appointment. 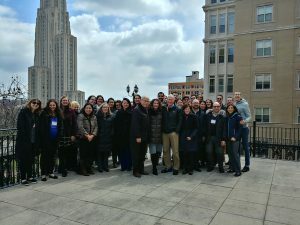 Participants in the program have a unique opportunity to work with a diverse group of senior faculty and mentors from the Departments of Psychiatry of the University of Pittsburgh and Stanford University, representatives from the National Institute of Mental Health, and past CDI participants.